You can tell Christmas is coming! Blimey, this is quite a month’s worth! 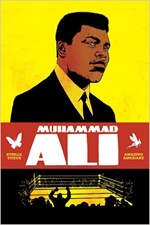 The histories of Muhammad Ali, Salvador Dalí, John James Audubon, Robert Johnson, even the game phenomenon Tetris are all told in comics for you. 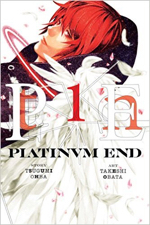 And there’s plenty of daring original graphic fiction on offer here, ranging from the second volume in Rob Davis’s mind-warping alternative England, to a new manga thriller by the duo behind Death Note. 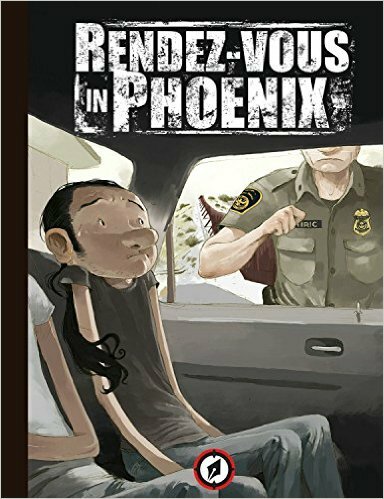 Personally, I’m pleased to see Mexico’s Tony Sandoval with his true-life romantic drama, Marcelino Truong translated at long last, and a short story compendium from Leela Corman. Lots to choose from, so there’s a good chance of you finding something here to appeal to your taste. 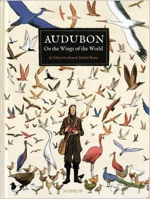 Throughout the first half of the 19th century, John James Audubon was America s dominant wildlife artist. Having always drawn birds as a hobby , it wasn’t until facing bankruptcy that he decided to embark upon an epic ornithological quest across America with nothing but his artist s materials, an assistant, and a gun. The journey was far from easy, but the dramatic, life-sized bird portraits he produced along the way were an immediate success upon his return. Audubon s legacy continues to this day, particularly in the deep concerns he later voiced for the conservation of the beautiful species he depicted. His seminal work, Birds of America, is one against which 20th and 21st century wildlife artists are still measured. 184pgs colour hardcover. When the lull of night falls over a sleeping midwestern town, an ancient unimaginable horror creeps violently and purposely through the night. That’s when the children come out to play. Children with eyes of solid back, devoid of emotion and remorse, and only asking for one thing… to come inside. But there are some who will not go quietly in the night. Some who will fight back to save not only their own souls, but their own children’s. This is their story. 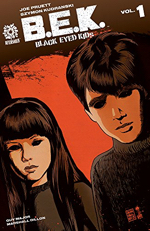 Collecting the first five issues of the sleeper hit series from Eisner Award winner Joe Pruett and artist Szymon Kudranski. 120pgs colour paperback. Strep throat! Hay fever! Influenza! 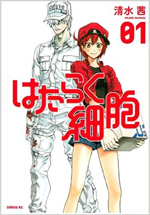 The world is a dangerous place for a red blood cell just trying to get her deliveries finished. Fortunately, she’s not alone… she’s got a whole human body’s worth of cells ready to help out! The mysterious white blood cell, the buff and brash killer T cell, the nerdy neuron, even the cute little platelets—everyone’s got to come together if they want to keep you healthy! 192pgs B&W paperback. In the future, the entire population is under a de facto dictatorship because of cerebral implants invented by one F.G. Wilson. Nolan Ska, an engineer, manages to travel back in time, with the intention of changing history by encouraging Wilson first career: novelist. But the man who will eventually become a seemingly immortal despot turns out to be a poor writer, and it will be up to Nolan to use his own memories to be his ghost writer… 64pgs colour paperback. A girl, a boy and a deserted reservoir. Cormorance is a story of fear, bravery and the redemptive force of connecting with the natural world. A wordless, purely visual story, it is – like any work by the award-winning Nick Hayes – a book of the utmost beauty, and a wonder to hold in your hand. 184pgs two-colour hardcover. Genius, eccentric, exhibitionist: there is no shortage of adjectives to describe the great surrealist painter Salvador Dalí. Yet this iconic artist and controversial thinker remains a figure shrouded in mystery. Plunging into the Spanish painter’s unbridled, fantastical universe, graphic novelist Edmond Baudoin guides us on the trail of a man known as much for his talent for self-promotion as for his bold and extraordinary work. 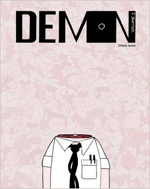 He emerges with a convincing personal vision of the man behind the artist. 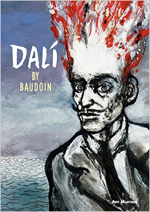 Commissioned by the Pompidou Centre, Paris, Dalí is a graphic novel of rare brilliance, which captures in beautifully expressive detail the life of one of the world’s most instantly recognisable painters. 160pgs part-colour paperback. 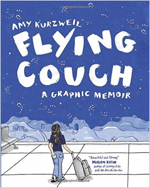 Flying Couch, Amy Kurzweil’s debut, tells the stories of three unforgettable women. Amy weaves her own coming-of-age as a young Jewish artist into the narrative of her mother, a psychologist, and Bubbe, her grandmother, a World War II survivor who escaped from the Warsaw Ghetto by disguising herself as a gentile. Captivated by Bubbe’s story, Amy turns to her sketchbooks, teaching herself to draw as a way to cope with what she discovers. Entwining the voices and histories of these three wise, hilarious, and very different women, Amy creates a portrait not only of what it means to be part of a family, but also of how each generation bears the imprint of the past. 288pgs B&W paperback. Garbage is an architectural-scale series of panels that transform a gallery into a comic book. Each ‘page’ of the story pops with colour off the wall, unfolding using the common tropes of comic books. 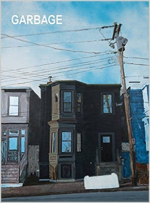 Taken together the paintings tell the story of neighbours in Halifax’s North End and a mysterious couch which shows up one morning on the narrator’s front curb. As the narrator confronts his neighbours, asking where it came from, he gains insight into their lives as well as his own. Garbage collects these paintings into a graphic novel with a commentary by curator Robin Metcalfe. 48pgs colour paperback. 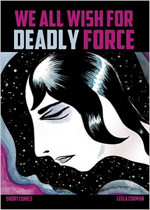 Charles Burns’ graphic trilogy has been hailed as one of the masterpieces of the form. 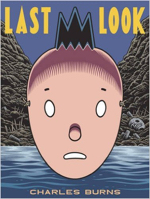 Now readers can find the long strange trip of Doug in all its mind-bending, heartbreaking totality. 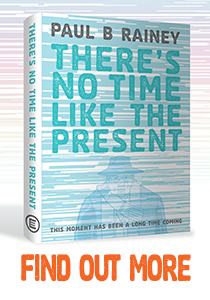 The fragments of the past collide with the reality of the present, nightmarish dreams evolve into an even more dreadful reality, and when you finally find out where all of this has been going, and what it means ... it will make you go right back to the first page and read it all again with new eyes. Just like Doug. 176pgs colour paperback. Mum is mad and Dad is busy, so now it’s up to the kids to find him. A sequel to Steven Weissman’s 2012 meditation on the challenges of modern adulthood, Barack Hussein Obama (also available from Turnaround), Looking For America’s Dog focuses instead on Generation Z. Teenagers Sasha and Malia navigate an increasingly strange and hostile world in search of their lost dog. But is a lost dog ever really just a lost dog? Like, what if it’s not America’s Dog that’s lost but America itself? 112pgs colour hardcover. From Crossroads Blues to Sweet Home Chicago, Hellhound on My Trail to Come On In My Kitchen, Robert Johnson wrote some of the most enduring and formative songs of the original blues era, songs that would go on to help shape the birth of rock’n'roll in the 1960s. Beloved of Clapton, Dylan and the Stones, Robert Johnson remains one of the most iconic and mythologised figures in popular music (and the first of many to die at the age of 27). Born in the South in Mississippi, Johnson made his way to the urban North as a travelling musician, but it was only when he returned to the South that he recorded the twenty-nine songs, in two sessions, which would create his legacy. Exploring the stories and legends that surround his life and death - his childhood, his womanising, his pact with the devil at the crossroads - Mezzo and DuPont have produced a fittingly creative and beautiful depiction of this most extraordinary life. 72pgs B&W hardcover. Cassius Clay is a kid who rushes into boxing by accident, following the theft of his bike. Clay becomes Muhammad Ali, and his talent for the sport is proven when he wins an Olympic Gold Medal. The World Heavyweight Champion never takes a hit without fighting back. Civil Rights activist, contemporary of Martin Luther King, Jr. and Malcolm X, Ali is one of the greatest icons of the twentieth century. 128pgs colour hardcover. Every night, tiny stars appear out of the darkness in little Sandy’s bedroom. She catches them and creates wonderful creatures to play with until she falls asleep, and in the morning brings them back to life in the whimsical drawings that cover her room. One day, Morpie, a mysterious pale girl, appears at school. 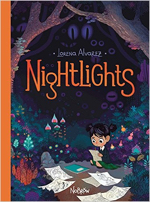 And she knows all about Sandy’s drawings… Nightlights is a beautiful story about fear, insecurity, and creativity, from the enchanting imagination of Lorena Alvarez. Lorena Alvarez was born and raised in Bogota, and studied Graphic Design and Arts at the Universidad Nacional de Colombia. A Junior Library Guild Selection. 56pgs colour hardcover. Troubled Mirai’s life changes when he gains the power of an angel, but he may need to become a devil to survive in the battle against others just like him. As his classmates celebrate their middle school graduation, troubled Mirai is mired in darkness. But his battle is just beginning when he receives some salvation from above in the form of an angel. Now Mirai is pitted against 12 other chosen humans in a battle in which the winner becomes the next god of the world. Mirai has an angel in his corner, but he may need to become a devil to survive. 176pgs B&W paperback. Tony Sandoval was born and raised in northwestern Mexico, where the temptation to cross the border in the US becomes a matter of the heart. Drawn by Love, his urge to visit his American girlfriend can’t wait for the lengthy, frustrating visa process standing in the way of their relationship. 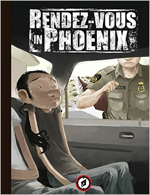 So he makes the ultimate romantic gesture: smuggling himself across the border, despite the dangers he’ll face from the heat, coyotes, barbed wire, and – most daunting – the US border patrol… An autobiographical account by the three-time Eisner-nominated writer/artist, an honest, true story about the hot-topic immigration issue in the news today. 80pgs colour hardcover. The classic short story, now in full colour. Shirley Jackson’s The Lottery continues to thrill and unsettle readers nearly seven decades after it was first published. By turns puzzling and harrowing, it raises troubling questions about conformity, tradition, and the spectre of ritualised violence that haunts even the most bucolic, peaceful village. 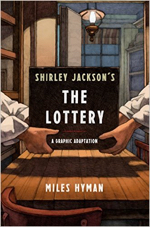 This graphic adaptation, published in time for Jackson’s centennial, allows readers to experience The Lottery as never before, or discover it anew. The visual artist - and Jackson’s grandson - Miles Hyman has crafted an eerie vision of the hamlet where the tale unfolds, its inhabitants, and the unforgettable ritual they set into motion. His four-colour, meticulously detailed panels create a noirish atmosphere that adds a new dimension of dread to the original tale. Perfectly timed to the current resurgence of interest in Jackson and her work, Shirley Jackson’s “The Lottery”: The Authorized Graphic Adaptation masterfully reimagines her iconic story with a striking visual narrative. 160pgs colour paperback / hardcover. 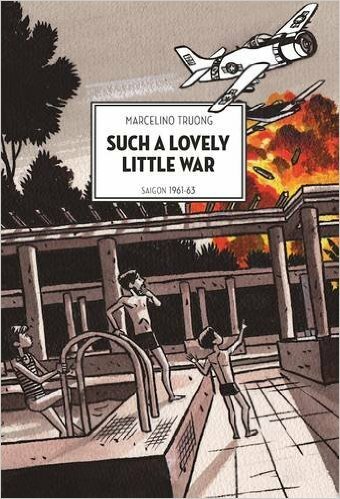 This riveting, beautifully produced graphic memoir tells the story of the early years of the Vietnam war as seen through the eyes of a young boy named Marco, the son of a Vietnamese diplomat and his French wife. 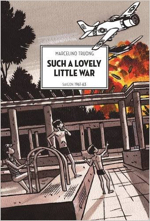 The book opens in America, where the boy’s father works for the South Vietnam embassy; there the boy is made to feel self-conscious about his otherness thanks to schoolmates who play war games against the so-called “Commies.” The family is called back to Saigon in 1961, where the father becomes Prime Minister Ngo Dinh Diem’s personal interpreter; as the growing conflict between North and South intensifies, so does turmoil within Marco’s family, as his mother struggles to grapple with bipolar disorder. Visually powerful and emotionally potent, Such a Lovely Little War is both a large-scale and intimate study of the Vietnam war as seen through the eyes of the Vietnamese: a turbulent national history interwined with an equally traumatic familial one. 272pgs colour paperback. SUPER! 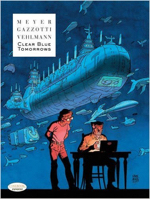 SUPER Weird Heroes is the first superhero book from Yoe Books/IDW. Over 500 pages, this ginormous tome is as thick as a brick. This bargained-priced book is filled with tons of rare, full-colour, never-before-reprinted comics which could cost you hundreds of thousands of dollars on the collector’s market. WEIRD! 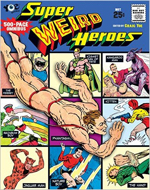 Super WEIRD Heroes is the most bizarro, wacky, wild, astonishing eye-popping, jaw-dropping, book… EVAH! It’s loaded with beyond-belief “WHAT TH’?!? !” moments! Wait till you tell your friends what you discover in its pages! HEROES! Super Weird HEROES will make you laugh, cry, and be immensely entertained! You’re going to witness Public Domain superheroes like The Hand (yes, he’s a giant hand), The Eye (you got it―he’s a yuuuge eye), The Bouncer (this super-hero-in-a-skirt’s power is bouncing)! There’s Rainbow Boy (he sports a towering rainbow mohawk on his head), Boomerang (he defeats Nazi hordes and weaponry by throwing a little boomerang), Kangaroo Man (don’t jump to conclusions―he’s even weirder than you think―his fighting partner is a talking kangaroo!). You’ll spit-take your milk reading the adventures of The Yellowjacket (he fights villains with bees), Madame Fatal (a cross dressing hero), and Phantasmo (who fights criminals barely wearing any clothes at all)! And this is just a small fraction of the Super Weird Heroes you’ll experience in this must-have book―there are over 65 super weird heroes in all. Super Weird Heroes is edited by the Eisner winner Craig Yoe who Vice Magazine called, “The Indiana Jones of nerd-perv artifacts!” 500pgs colour hardcover. It is, perhaps, the perfect video game. Simple yet addictive, Tetris delivers an irresistible, unending puzzle that has players hooked. Play it long enough and you’ll see those brightly coloured geometric shapes everywhere. You’ll see them in your dreams. Alexey Pajitnov had big ideas about games. In 1984, he created Tetris in his spare time while developing software for the Soviet government. Once Tetris emerged from behind the Iron Curtain, it was an instant hit. Nintendo, Atari, Sega―game developers big and small all wanted Tetris. A bidding war was sparked, followed by clandestine trips to Moscow, backroom deals, innumerable miscommunications, and outright theft. New York Times–bestselling author Box Brown untangles this complex history and delves deep into the role games play in art, culture, and commerce. 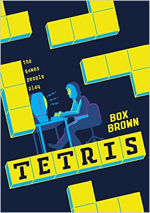 For the first time and in unparalleled detail, Tetris: The Games People Play tells the true story of the world’s most popular video game. 256pgs colour paperback. In the British Comic Award-winning The Motherless Oven, Scarper Lee asked: “Who the hell is Vera Pike?” In the second part of Rob Davis’ trilogy, we get a chance to find out. This is Vera’s story. Grave Acre is a cruel world of opportunity and control. Vera’s mother is the Weather Clock, the omnipotent and megalomaniacal Prime Minister of Chance. Her father is a can opener. Charting Vera’s unsettling childhood, the book takes us from her home in Parliament to suicide school, and from the Bear Park to the black woods that lie beyond. In the present day, Vera and Castro Smith are determined to see their friend Scarper again - but is he still alive? And if so, can they save him? Can anyone outlive their deathday? Both a sequel and a darkly inventive standalone graphic novel, The Can Opener’s Daughter answers many of the questions posed in The Motherless Oven, while asking plenty more of its own. 160pgs B&W paperback. The golden age of adventure stories returns with this splendidly designed, action-packed, globe-trotting tale that combines the bravura storytelling of Kipling with the irresistible style of The Adventures of Tintin. Behind the staid public rooms of an old world gentlemen’s club operates a more mysterious organisation: The Explorers Guild, a clandestine group of adventurers who bravely journey to those places in which light gives way to shadow and reason is usurped by myth. The secrets they seek are hidden in mountain ranges and lost in deserts, buried in the ocean floor and lodged deep in polar ice. The aim of The Explorers Guild: to discover the mysteries that lie beyond the boundaries of the known world. Set against the backdrop of World War I, with Western Civilisation on the edge of calamity, the first instalment in The Explorers Guild series, A Passage to Shambhala, concerns the Guild’s quest to find the golden city of Buddhist myth. The search will take them from the Polar North to the Mongolian deserts, through the underground canals of Asia to deep inside the Himalayas, before the fabled city finally divulges its secrets and the globe-spanning journey plays out to its startling conclusion. The Explorers Guild is a rare publishing opportunity, powered by the creative passion of one of the world’s true storytelling masters, Kevin Costner. 770pgs two-colour paperback / hardcover. We All Wish For Deadly Force is a collection of short stories by Leela Corman, including devastating personal loss, teaching bellydancing classes, her family in World War II Poland, reports from an American bellydancer about life in post revolution Egypt, and more. 88pgs colour paperback.